Ask the Hotel Lawyer™: America is on sale! Understanding the exchange rate impact on hospitality. Industry insights from JMBM’s Hospitality Lawyers. Some of the most popular articles here are the industry updates, like the ones posted after NYU and the NABHOOD Conference a few weeks ago, with many of the industry experts’ top slides. triggered quite a few questions about the impact of currency exchange rates on our industry, so I thought I would offer a little more detail to those who are intrigued by America being on sale because of the fall of dollar against most of the world’s major currencies. The great data from PKF, Smith Travel Research, HVS, CB Richard Ellis, PricewaterhouseCoopers and others are all easily accessible under the Topic “Outlook and Trends” at the Blog. To get there, just go to www.HotelLawBlog.com or GOOGLE “hotel lawyer” and click on the top entry. At the top you will see 6 tabs. Click on the one in the middle that says “Hotel Law Topics” and then select “Outlook and Trends” from the drop-down box. You can also use the Search tab at the top (2nd from the right — right next to the Topics tab). The search function will let you search for any name or key phrase. The Smith Travel Research slides have some great data (see Presentation for NYU and Update from NABHOOD). The slide below appeared in the posting from NABHOOD. It was presented by Jan Freitag of STR. 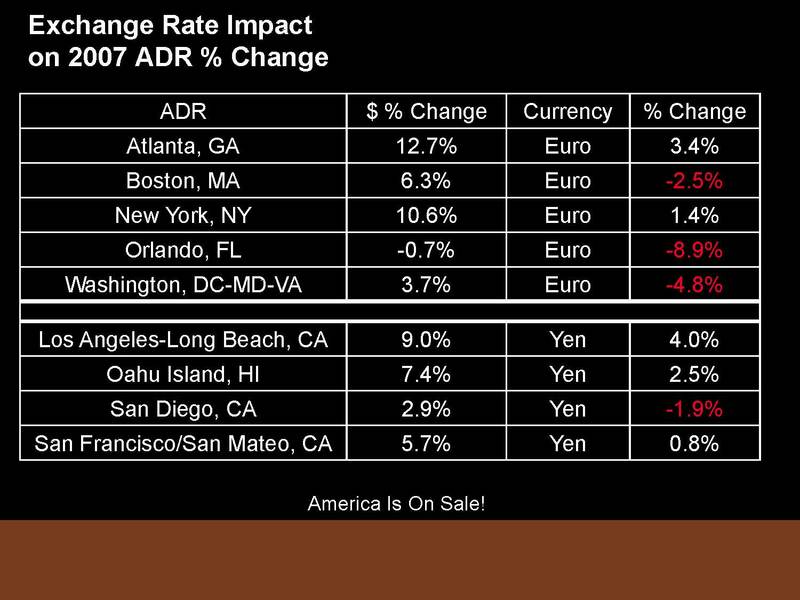 I commented that I also find it particularly valuable to see that in the coastal areas — such as Atlanta, New York, Los Angeles, Oahu and San Francisco, the EXCHANGE RATE impact has been so significant in the ADR change (ranging from 4% in LA and 3.4% in Atlanta to a mere 0.8% in San Francisco. But somehow it has had a NEGATIVE impact in Orlando of 8.9%, 4.8% in Washington, and 2.5% in Boston. As always, I enjoy and appreciate your articles! I was a bit puzzled by the exchange rate impact. One would assume that the extremely weak U.S. dollar would [at least] allow hotels and resorts to capture a very good ADR from foreign visitors? Why the negative impact in some instances (Boston, Orlando and D.C.)? In other words, the slide goes to the relative impact of U.S. ADRs to those using foreign currency. It does not bespeak actual decreases in ADR in the indicated markets. Split rates for domestic vs foreign guests? STR’s Jan Freitag observes that the data supporting this phenomenon suggests that hotels should keep their rates flat or raise them slightly when marketing to Europeans. This observation leads to an intriguing idea! The data suggests that hotels in some markets obviously felt that they would lose domestic travelers if they raised rates sufficiently to stay up with the Euro and the Yen. Why else would Orlando fail to capture 8.9% of ADR relative to the Euro? But what if hotels could charge split rates — one rate for domestic guests feeling the economic pinch of our current economic cycle and another rate for guests riding high on currencies worth 50% against the dollar than they were only a short while ago? I encountered something like that a few years ago when the Australian dollar was at historic lows against the U.S. dollar. In fact it was about $0.55 Australian to the $1.00 U.S. Most of Australia seemed to be on sale at half price. If something cost a dollar in the U.S., it typically cost a dollar (Australian) in Sidney. But I could get almost two Australian dollars for every U.S. dollar I spent. This worked great in the wine districts of the Barossa and the Margaret River. But when we went to arrange a 10-day live-aboard dive vacation of the Great Barrier Reef, we encountered different rates for U.S. travelers and Australian travelers. They made us pay more for the same event than our Australian friends on the same trip, because it was half as expensive for us — or that was their reasoning. It may be easier to arrange such price differentials on a single website for Australian dive trips than through the multiple channels through which hotel rooms are booked. But it does provide some food for thought. What do you think? Could we have split rates? Should we have split rates?